Of all the Christmas markets in the world, German weihnachtsmärkten are simply the best. 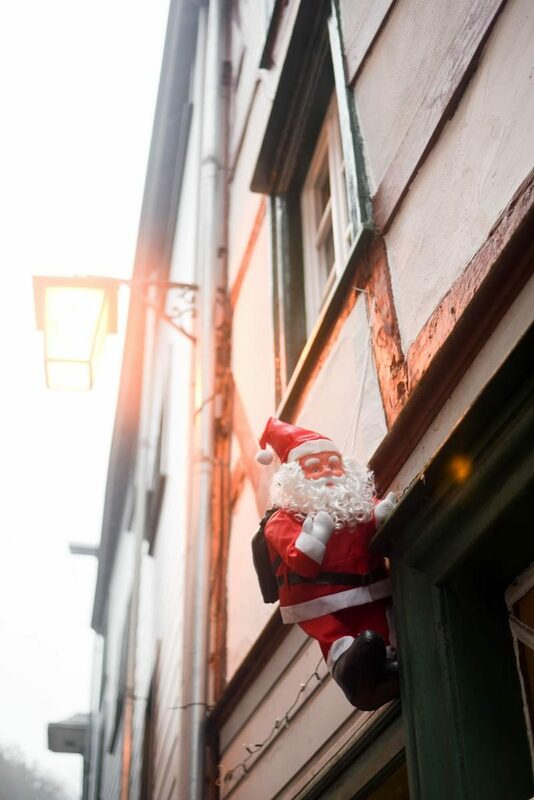 From late November to just before Christmas Day many German towns turn into picture-perfect fairy tale wonderlands. 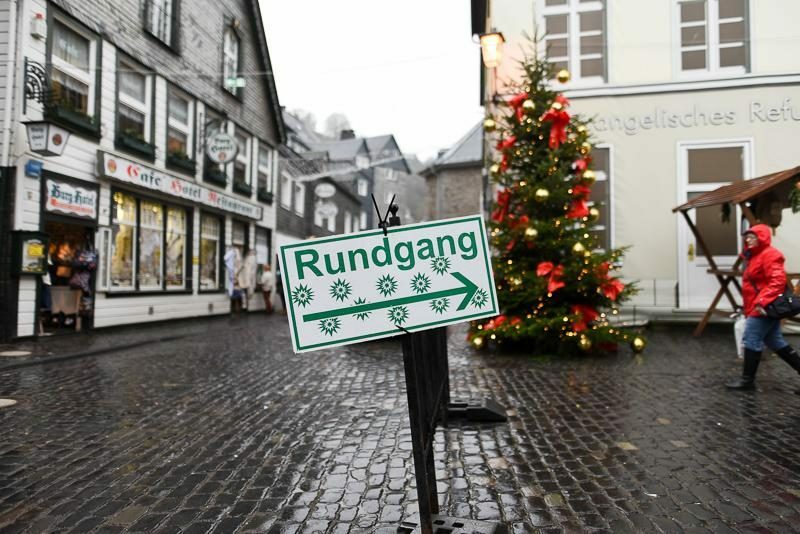 With food stalls selling glühwein, reibekuchen and Brätwursten à volonté, you know you’re in for a feast. 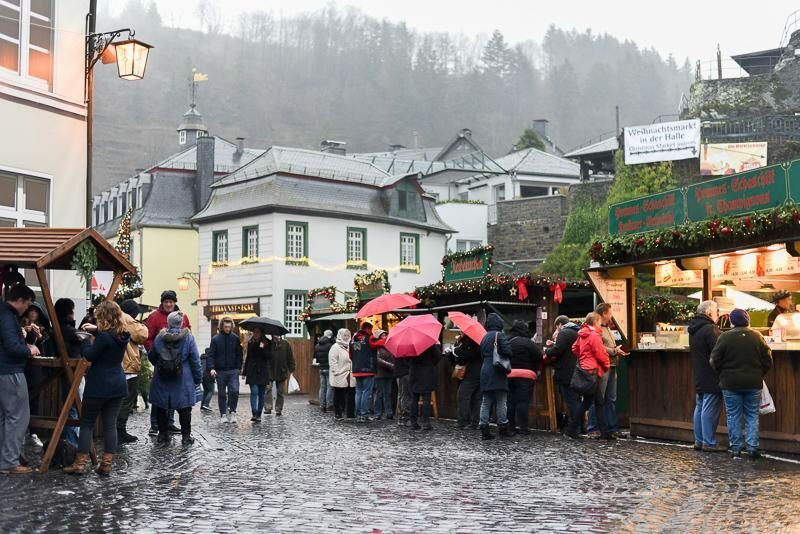 And even if you’re not into the German cuisine, nothing quite beats the coziness of German towns around Christmas time. The weekend before Christmas we drove down to Germany with a group of friends to get into the Christmas spirit. 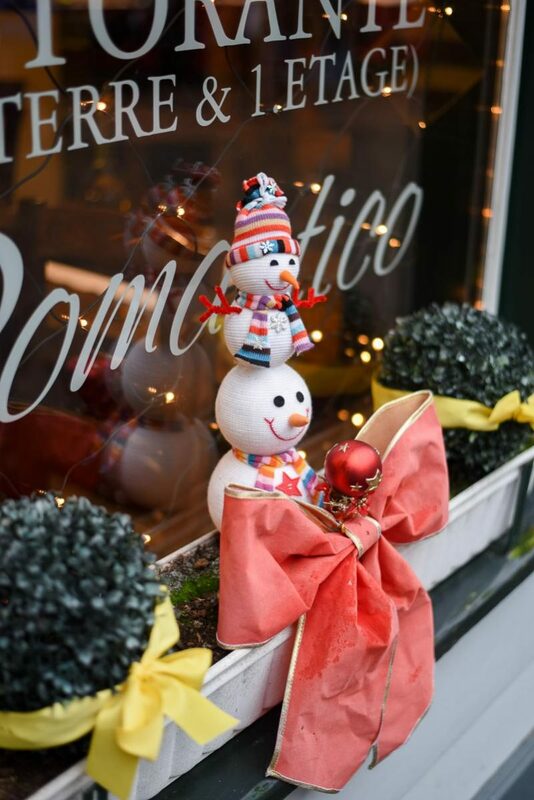 Living in Antwerp means we can drive to popular Christmas markets such as Düsseldorf, Aachen, Cologne and Monschau in just about two hours. 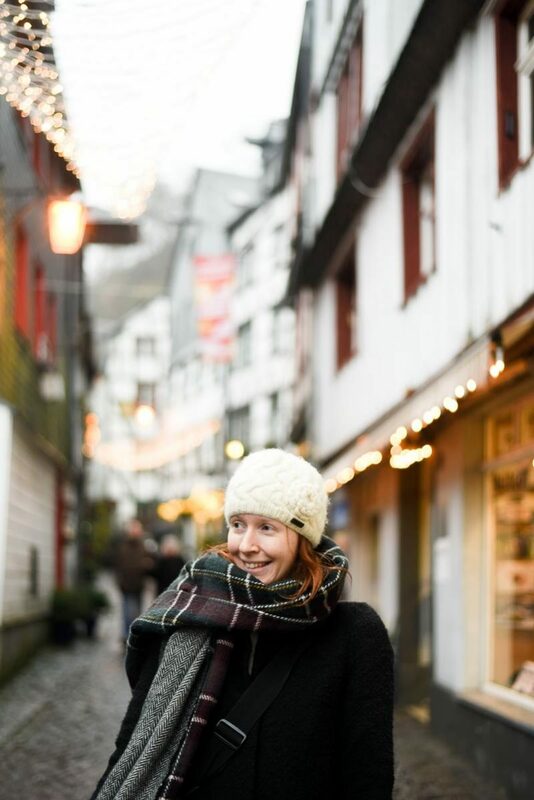 This year we let our friends decide the destination and we ended up in Monschau! 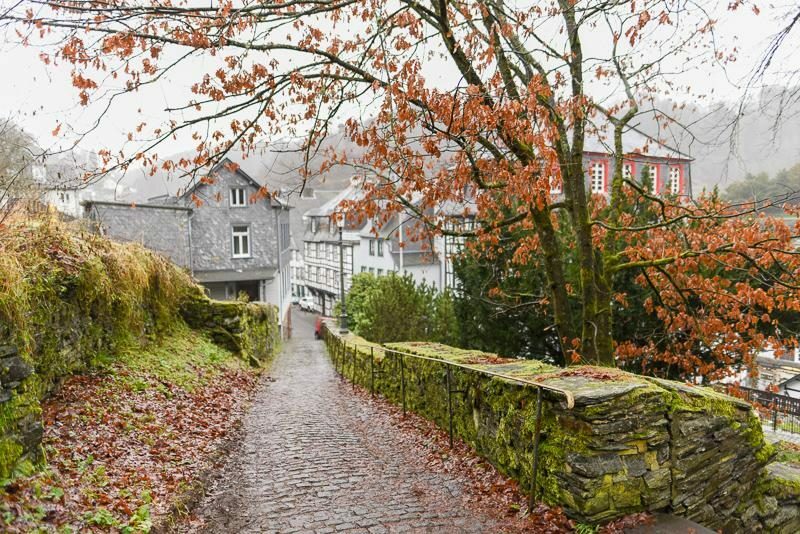 Monschau lies at the end of the main road that crosses Belgians oldest nature reserve called High Fens (Hoge Venen). If it weren’t so damn cold in Winter, I would have loved to stop there in the morning and go for a hike. When I was young my family used to visit the High Fens every now and then and I can vividly remember its natural beauty. 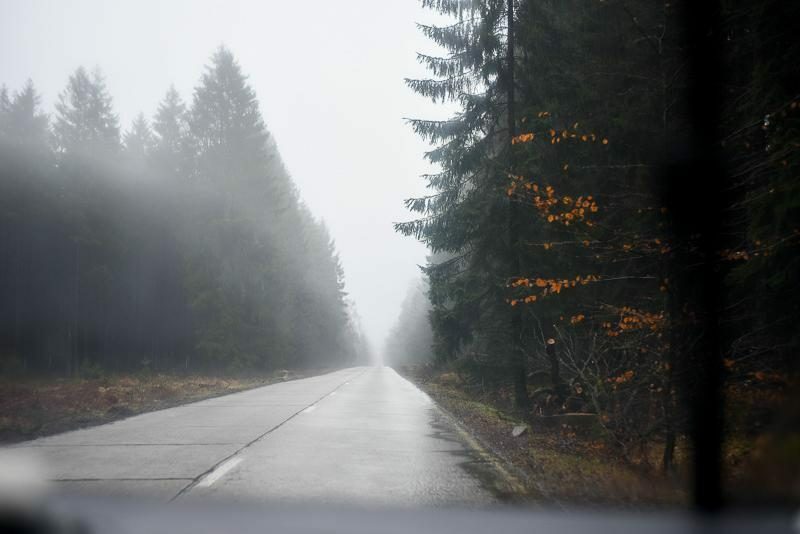 On this particular day in late December it was very foggy and there were remnants of the last snow storm scattered around the fields. It would have been unwise to hike in such circumstances and I wouldn’t be the first person to go missing in the vast area. So, we left for our trip only at noon so we’d arrive in Monschau just when the market opened. German Christmas markets are usually open air markets that pop up during advent. 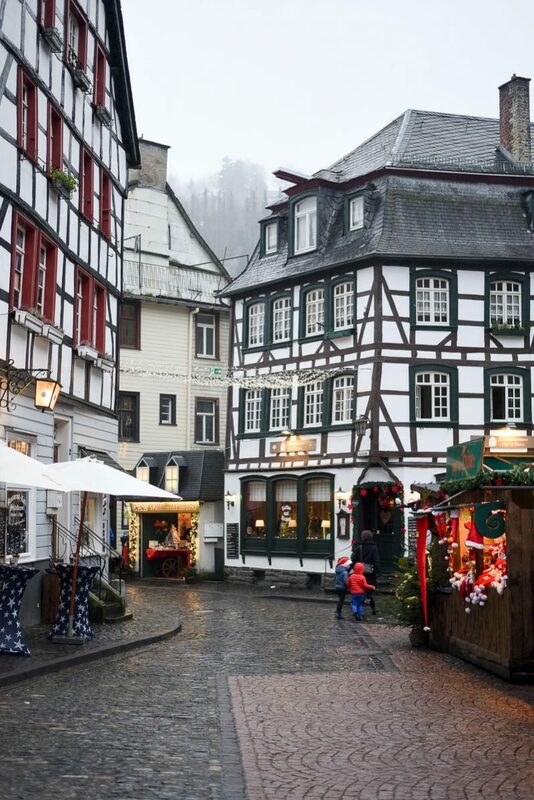 In Monschau some parts of the market are indoors. Most German Christmas markets are made up of rows and rows of quaint little stalls selling gifts, hot drinks, local delicatessen and what I like to call ‘German fast food’. In larger cities such as Düsseldorf and Cologne you can find multiple smaller markets scattered throughout the city center. Some markets also have ice rinks or iced tracks for sleighing. Cities also often organize side events such as winter walks, light shows, fire works and other fun stuff like that. Almost all markets that I’ve visited so far were free to enter, but I know there are some where you have to pay an entrance fee so be sure to check that before you go! Monschau is a small historic town in the Eiffel region of Germany, just across the border with Belgium. It’s your typical German town with half-timbered houses, a coffee house or two and a river called the Rur is running through the center. The historic center lies at the bottom of the river valley. 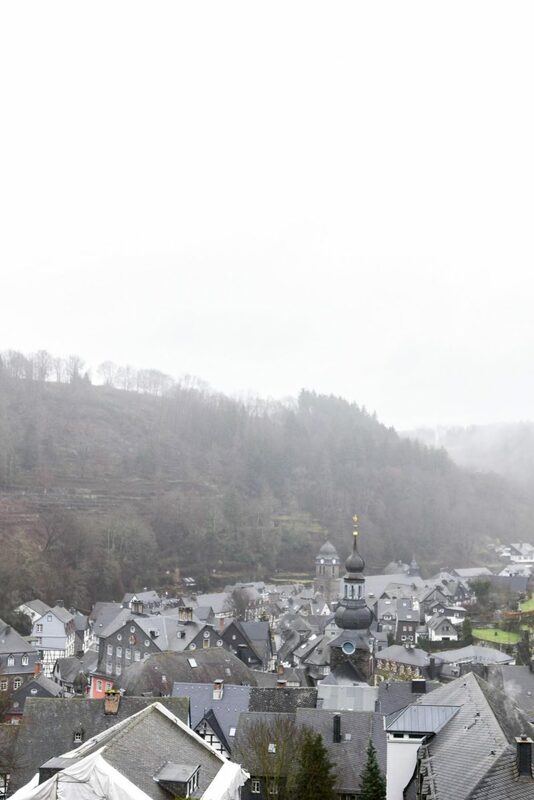 Atop the hill is Monschau Castle, which we always pass when we walk down to the city center. The heart of the city has supposedly remained nearly untouched for 300 years. During spring and summer a lot of people hike the region. It’s also a popular place for mountain bikers. 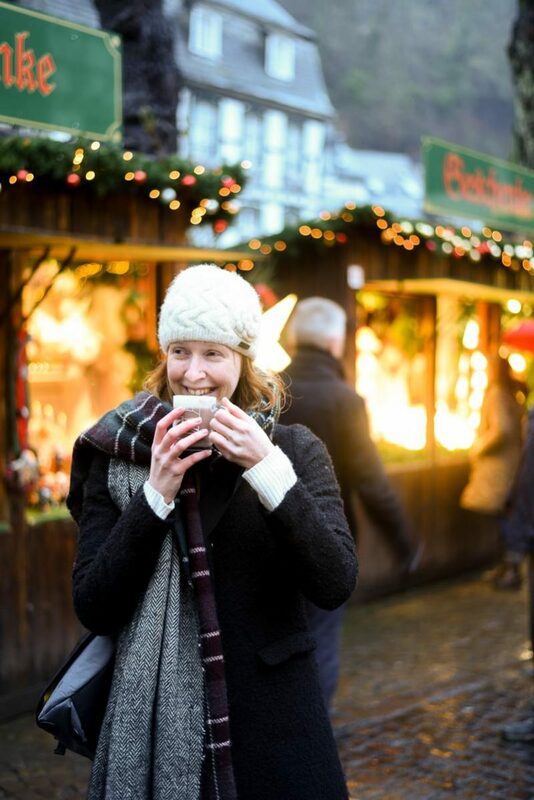 In winter the Christmas market lures thousands of people into the city to enjoy the coziness and a good glass of glühwein! I’m a big fan of the typical German fast food. 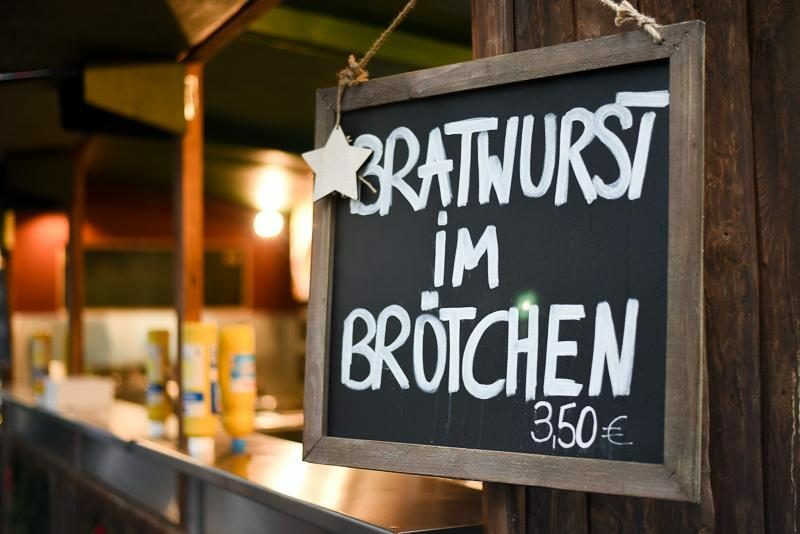 Brätwurst im brotchen mit saurekraut? YES PLEASE! 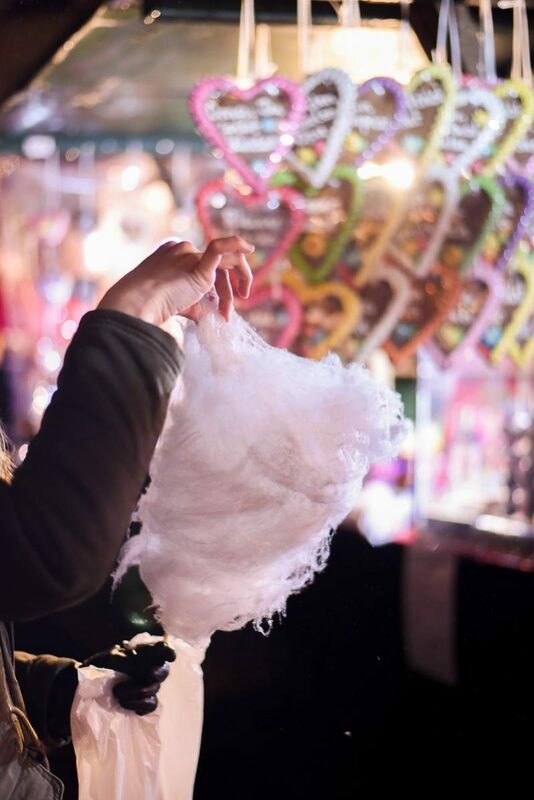 There are plenty of other comforting winter foods to try and taste at a weihnachtsmarkt too. So don’t be shy and try something new! I bet you’re gonna love it!! Roast potatoes with spices and mushrooms: I think our friend P ate about three plates of this stuff over the course of one evening. It’s a big plate full of roasted potatoes, topped with a sauce of your choice and then a big scoop of sauteed mushrooms is added on top. Some stalls also offer sauteed cabbage instead or with the mushrooms. This plate is a good base if you’re thinking about trying all the Genever (shots of alcohol, the base of Gin) flavors later on, haha. Roasted nuts and chestnuts: A personal favorite. Caramelized nuts are just so addictive! I like to pick up a small bag before returning home. Reibekuchen: Best described as ‘potato pancakes’ these salty treats are always on my to-eat list. I’m not going home if I didn’t have my reibekuchen. They’re not that special, but they have become part of our weihnachtsmarkt tradition. Flammkuchen: Kinda like a pizza, but crispier. Flammkuchen are made of thinly rolled out bread dough and are usually topped of with either melted cheese or cream, onion slices and bacon. Different variations exists so check the menu and pick your favorite! Crêpes: Sweet or salty. My favorite is still the classic with nutella. Dutch pancakes: Known in Dutch as ‘poffertjes’. Guys, if you pick one dessert from my list then choose this! You have to try these mini-pancakes with powdered sugar and dewy melted butter. So. Freaking. Good! Gingerbread: Sold mostly in the shape of big hearts with cheesy quotes on them. You’ll find gingerbread in at least a dozen stalls on any Christmas market. I’m personally not a fan of this, haha. Mulled wine: They say there’s nothing like a soothing mug of mulled wine on a cold winter’s day. I wouldn’t really know, because I rarely drink alcohol, but my friends are all about mulled wine during winter time. Mulled wine or glühwein is usually made of heated red wine with a dash of sugar and infused with citrus fruits such as lemon, oranges and/or clementines. Stars of the show are the mulled spices: Cinnamon, cloves, nutmeg, star anise and maybe a bay leaf or two. When all of this goodness is mixed and then heated on the stove, an absolutely phenomenal scent spreads through the air. I imagine Heaven to smell like that in Winter. Eierpunsch: A German egg-based drink that is similar to egg nog. I don’t like egg nog, so I must admit that I haven’t tried this myself but again, my friends go wild about this. It’s made of egg yolks, sugar, white wine and vanilla. Hot Chocolate: My favorite! And I always ask to add whipped cream (as the photo above proves!). A lot of people have their hot coco spiced with Amaretto, but I like mine just the way it is. 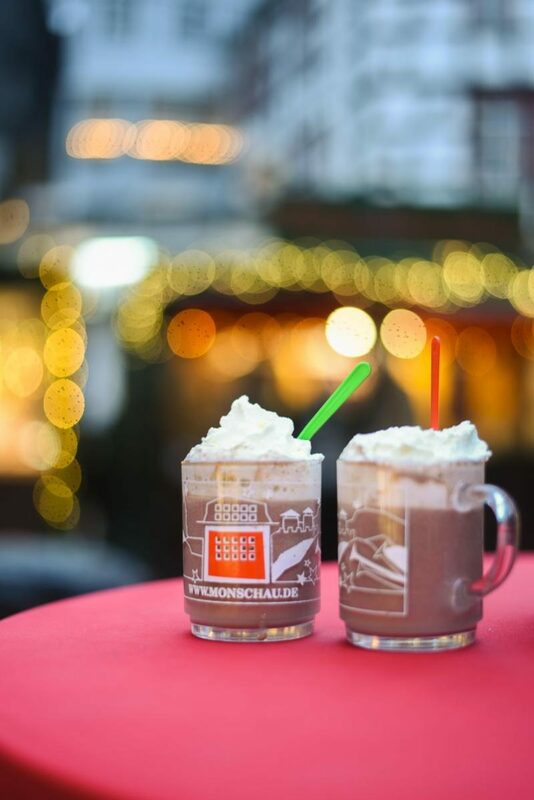 One last tip: On most German Christmas markets you will get your hot drinks in a ceramic mug with the logo of the town or a specific drawing on it. Some ceramic mugs are shaped like boots and some towns offer glass mugs as well. Usually stall owners ask to pay a €2,5 guarantee per mug so you can choose whether or not you want to keep it. I always keep one and over the years I have collected quiet a few! My collection of Christmas mugs. Monschau is the red one in the middle. 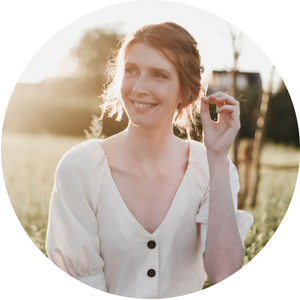 Hope that you are having a nice start to your week! I’m feeling better so back at work this week for me.